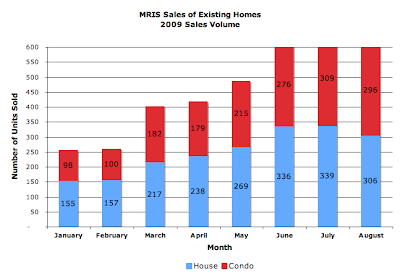 Using MRIS's 2009 data published to date [August], I thought it'd be interesting to see the sales trends for sales of existing homes and condos in the District. 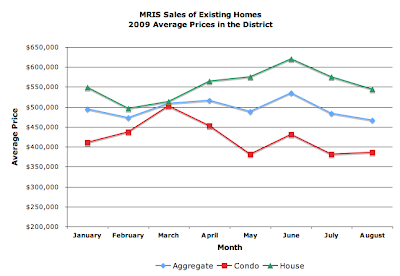 Generally, prices are flat to slightly negative for the year. Compared to January, August's aggregate sales prices are 5.86% lower. 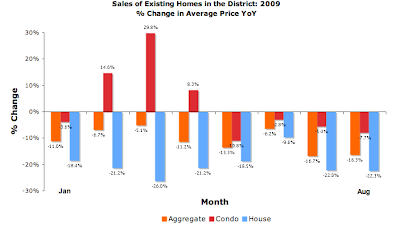 Condos are down 6.33% and home prices are essentially flat, down 0.7%. Except for three months when condo prices spiked, YoY prices are in negative territory compared to 2008. What's particularly quite striking is the significant increase in sales volume as the year progressed, which I'm sure results in no small part from the Fed's efforts to create market liquidity through its purchase of $1.45T in mortgages. Despite the surge in sales, though, prices continue to slide. Might it make sense that the additional sales were caused by a glut of homes on the market, hence the lower prices?